This page shows warning signs and labels for Tetracycline (internal use) (CAS No. 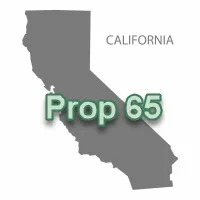 60-54-8), which is on the current California Proposition 65 List of harmful chemicals. California updated Prop 65 warning sign requirements effective August 30, 2018, and these signs meet those specifications. Prop 65 signs must now list specific chemical names and, in some cases, sources of exposure. You will need to determine if your use of this chemical requires exposure source warnings.